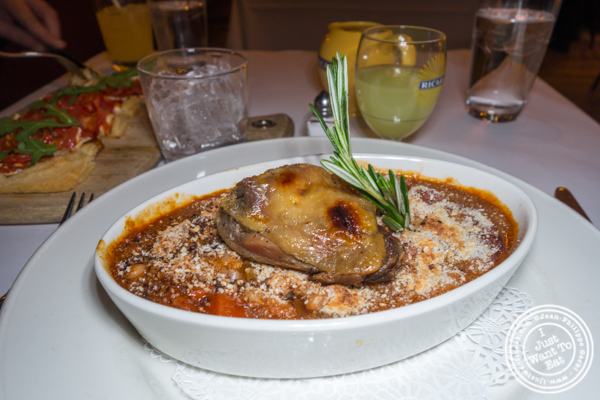 I have been to Brasserie Cognac few times but for brunch, so it was time to try their dinner, knowing that there was one dish that I wanted to taste there: the cassoulet, a white bean stew that is up and coming in New York. Owned by a descendant of the famous writer Victor Hugo (Les Misérables), Brasserie Cognac serves a delicious French fare where classic brasserie dishes are proposed like escargots (remember, the butter sauce is the best with pieces of bread, but the salad that comes with it is as if they wanted to justify a higher price) or steak frites. 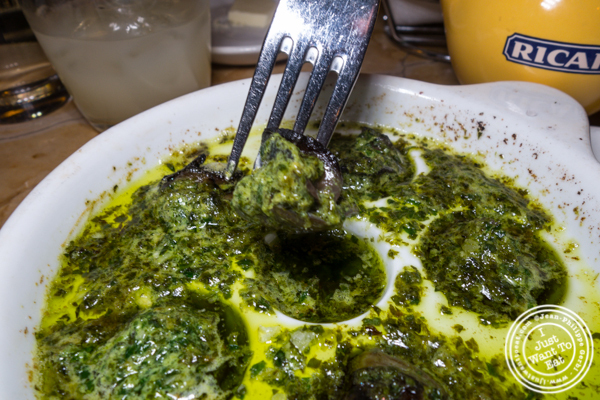 Their cheese soufflé that can be served an appetizer or an entree (the entree will have a salad, the same as for the escargots by the way), is very good, elevated with truffle oil. Vegetarians have few choices like the cheese platter that I always consider to be a bit of a ripoff as you get small pieces of cheese for what you pay, or the goat cheese and tomato tart that is succulent, the three main components that are the puff pastry, goat cheese and tomato working well together, in a balanced way. As far as the cassoulet is concerned, I however was quite disappointed: served at the time of this post only on Thursdays, it was pricey for the quantity and gave me the impression that it was a fusion between a boeuf bourguignon and a cassoulet, the former being more prominent. I would definitely not go to Brasserie Cognac to try this dish, rather La Sirène or Bar Boulud. As beverages, they have a nice selection of wine, few whiskey (no French ones though that could be a good idea), beers and spirits. If you like anise based alcoholic beverages, try the Ricard that is quite refreshing. 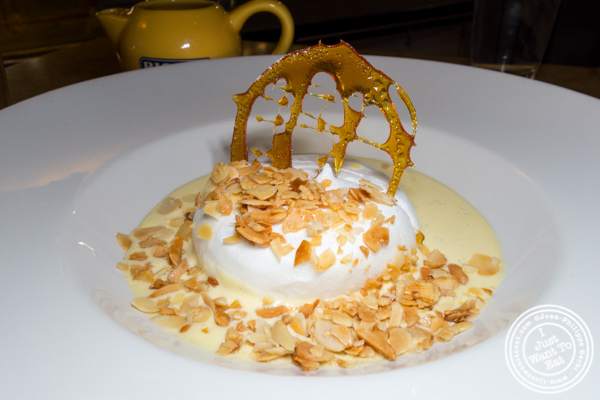 Dessert is quite good with a special mention to the île Flottante or Floating Island, a dessert made with egg whites that sit on top of creme anglaise (a vanilla sauce): this is a must have.